Bishop Miege and Blue Valley West played to a 7-7 halftime tie, but the Stags exploded for four touchdowns in the second half to pull away for a 35-7 win. Leading 13-7 in the third quarter, Miege blocked a Jaguar punt and recovered at the Blue Valley West 5-yard line. One play later, Ryan Willis hit tight end Chris Ford on a 5-yard touchdown pass and a 20-7 lead. Willis hooked up with Nolan Gray in the end zone for a second time on the night to extend Miege’s lead to 28-7. Blue Valley West would mount a response, but Tyler Cox fumbled through the end zone for a touchback. On Miege’s first play, Dawson Downing went 80 yards for a touchdown and a 35-7 lead. Downing rushed for 266 yards and two touchdowns on the night, while Willis passed for 185 yards and three scores. Connor Byers hit Hayden Hoffine on a 9-yard touchdown pass in overtime to lift Bonner Springs to a 31-24 win over No. 4 KC Piper. The Braves led 21-10 as late as 3:30 in the third quarter after Byers scored from five yards out. Wyatt Hays then returned an interception for a score to pull Piper within 21-16 late in the third quarter. Bonner Springs added a field goal and took a 24-16 lead into the fourth quarter. Piper standout Colton Beebe scored from a yard out with about four minutes remaining and added the two-point conversion to tie the game at 24. After the Braves went three-and-out, Travon Jones broke a 61-yard touchdown run for Piper that was negated by a penalty. After the Braves scored first in overtime, Piper faced a fourth-and-goal from the 4-yard line but the Pirates final pass fell incomplete. Spearville held off Ness City 50-38 in a key game in District 7 of 8-Man, Division I. The Lancers built a 30-8 lead in the first half but the Eagles pulled to as close as 30-20 in the third quarter. The teams would trade touchdowns with Spearville leading 38-26 entering the fourth quarter. The Lancers score two touchdowns to take a 50-32 lead and held on for the key win. Wichita Trinity scored in every quarter in registering an impressive win at Cheney, 38-7. Tyler Burns rushed for more than 150 yards and three touchdowns to lead the Knights. Trinity quarterback Matt Jones passed for 177 yards and connected with Garrett Kuntz on two touchdown passes. Tyler Trego scored Cheney’s only touchdown on a short run in the third quarter. Argonia-Attica dominated Caldwell 38-8 in the first half en route to a 60-38 district win. The Titans moved into the driver’s seat in 8-Man II, District 4 with the win. Alec McDaniel passed for 214 yards and four touchdowns, and rushed for 172 more yards and five scores. Devon Newberry added 96 yards rushing and a score. Five different Titan receivers caught passes led by Garrett Wells’ five receptions for 83 yards and two touchdowns. Turner Wintz scored on a 10-yard run in overtime to lead Hutchinson to a 40-37 win over Maize. The Eagles had taken a 37-34 with an Alan Sanchez 24-yard field goal on their overtime possession. After the Eagles built a 20-14 halftime lead, Hutchinson responded with three consecutive touchdown runs from Blaik Middleton to build a 34-20 lead. Maize would tie the game at 34 with a Connor Lungwitz touchdown run and pass in the fourth quarter. Lungwitz passed for 343 yards and four touchdowns to lead Maize. Middleton led the Salthawks with 282 yards rushing and five touchdowns. Wintz added 144 yards on the ground including the deciding score. Pittsburg dominated Parsons 56-0 in a game that was forfeited by the Vikings with 5 minutes remaining in the second quarter. The Purple Dragons scored their eighth touchdown of the game with just under nine minutes remaining in the second quarter and a running clock was initiated. Parsons would forfeit a short time later after a second Viking player was taken off the field by ambulance. Alex Barnes carried 10 times for 240 yards and five touchdowns for the Purple Dragons. Frontenac broke a scoreless tie on the final play of the first half and held off rival St. Mary’s Colgan 14-7. Raider quarterback Austin Seward scrambled around, reversed field and found Ryan Long on a 29-yard touchdown pass on the final play of the second quarter for a 6-0 lead. After a Colgan fumble, the Raiders cashed in as former Panther Keaton Bolinger scored from two-yards out to extend the Frontenac lead to 14-0. Colgan would score on a Ryan Cedeno touchdown pass to Ian Duncan, but the Panthers could not keep the Raiders from running the clock out in the fourth quarter. Topeka High outscored Topeka Seaman 21-0 in the second half to claim a 49-14 win. Topeka quarterback Alec Beatty rushed for 195 yards and two touchdowns on runs of 77 and 70 yards. Beatty also passed for 263 yards and three scores. He connected with Khalil Austin for 162 yards and two touchdowns and hit Dante Brooks four times for 100 yards and a score. 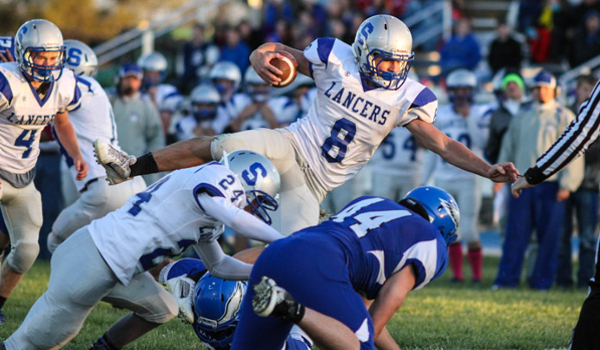 Ian Rudzik rushed for 324 yards and seven touchdowns on 13 carries as Ulysses blasted Goodland 73-33. The Tigers led 67-19 at halftime as younger players saw a lot of action in the second half. Rudzik has now rushed for 1,113 yards and 16 touchdowns on the season. In the battle of unbeaten, Andale rushed for more than 430 yards in beating Wellington 63-21. Hank Eck led the Indians with 150 yards rushing, while Anthony Capul added more than 100 yards on the ground as well. Eck and Capaul each rushed for three touchdowns in the game. Trevor Nance threw for more than 230 yards in the loss for Wellington. Running back Miles Alexander rushed for 258 yards and three touchdowns on 22 carries to lead Blue Valley Northwest past Blue Valley Southwest 28-10 on Thursday night. The Huskies scored two fourth-quarter touchdowns to pull away from the Timberwolves. Blue Valley Southwest scored with around 30 seconds remaining in the game to cut in to Northwest’s 28-3 lead. Jake Robison scored on a 1-yard run as time expired to lift the Paola Panthers to a 20-14 win over Ottawa. The Panthers won their fourth straight game after a 14-13, overtime loss to Spring Hill to open the season. Wellsville knocked Santa Fe Trail from the ranks of the unbeaten with a 12-6 win. The Eagles and Chargers were tied at 6 at halftime before the Eagles broke through with the winning points in the second half.